What can I ask a vet? How effective is the distemper vaccine? 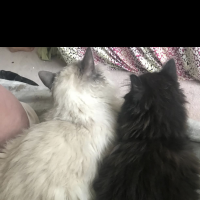 Fur clumping/bump after vaccines... normal or not? does the second rabies shot cause cancer? VET SHOT WRONG VACCINE?! HELP!! My kitten is almost 4 months old and has not been to the vet yet - will be ok? Meha has been sneezing since she received her rabies and distemper shots, is this common? We have a litter of 1o week old kitties that live in our barn. What vaccinations must they have? I have an eight week old kitten. What shots do I need to give him first? What to expect at the vet's office? Rabies & FVRCP vaccine reactions? Just got back from vaccines. Is she sick or in heat? How long after spaying should my "former-stray" lady cat be vaccinated and dewormed? To vaccinate or not to vaccinate... that's our question! Is Casper allowed to go outside before his 2nd vacination?? Does my kitty need the Feline Leukemia vaccine? My 11 week old kitten is very sleepy, and was coughing/gagging weird? Indoor cats and rabies vaccines? Is there a rabies vaccine I can give at home? Shot reaction - leg kicking? Did my cat have an allergic reaction? I think my cat is in shock because of her first trip to the vet, what do I do? Would a vet be able to do tests to see if my cat has been vaccinated? Is it absolutely necessary to finish out my kittens shots? my kitten is very groggy after vaccines a day ago how long is this normal for? Would it be wise to get my indoor-only kitten a leukemia vaccination? How important is it for me to get the normal shots for my kitten? Can I board my mother cat and her kittens and do the kittens need to be vaccinated first ? Must my senior (12 yrs) cat, who is FelLeuk positive still get all her vaccinations?